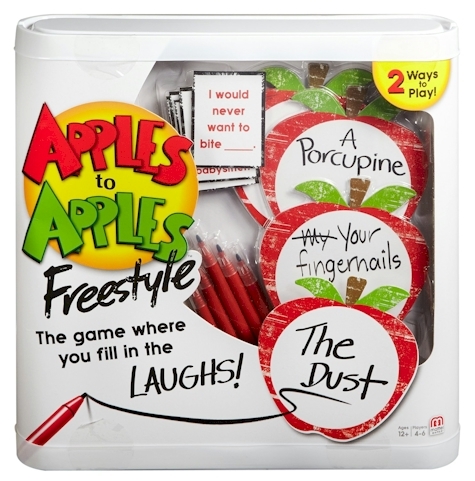 Amazon has got this Apples to Apples Freestyle game for only $4.72. FYI, compare this Amazon price to the Target price of $19.99. This game received 4.7 out of 5 stars over 81 customer reviews. This is an Amazon Add-On item, which means that it ships for free with a $25 minimum order if you are an Amazon Prime member price of $4.72 counts towards that $25, or it ships for free with a $49 minimum order if you're not a Prime member. You can buy multiples of this item to help get you to your $25 or $49 minimum for free shipping but because of the low price, it is quantity limited to 3 per account. The sky's the limit in Apples to Apples Freestyle game!